Happy Spring my friends! I cannot wait to style all the fun parties that will be celebrated during this season, and to kick off spring time, I want to show you this Superhero birthday party for girls that I had the pleasure to style exclusively for Twinkle Twinkle Little Party Magazine. You can see this party along with so many others here. Our superhero party was styled at One Eleven East. It is a historic urban loft that is perfect for hosting events. I love their white walls because they really make my party colors pop. One of the things that I loved about this party is the backdrop! So easy to make and looks so unique and fun. I really wanted a creative focal point for the party table, so I decided to make a huge superhero mask. The super-sized backdrop was handmade with heavy cardstock. It measures approximately 5 feet by 2 ½ feet. It is easy to recreate your own. All you need is black cardstock and an Exacto knife. Custom desserts are a must when you are partying with Super Girls! I served a chocolate cake covered with light pink frosting, with the cutest cityscape topper made by sweet friend Susan from Sugar Parties LA. 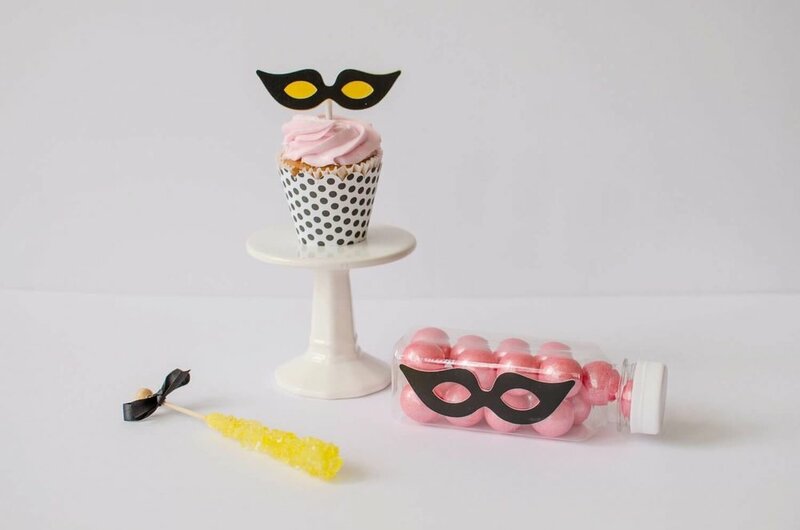 The cupcake toppers also feature superhero masks and capes which were also made by Susan. My favorite dessert are the sugar cookies. The details are amazing and they match the theme perfectly! Amy from Amy Cakes and Sweet Treats did an amazing job! I used mini superhero masks as table scatter just to add more detail. I also added the happy birthday banner to the front of the table. It is so bright and super fun! Balloons are festive and inexpensive. I decided to frame the table using different sizes, shapes and designs of balloons. I finished them with a black ribbon for a more tailored look. The most important tip about balloons is- have fun with them! Our little heroes enjoyed a prepackaged lunch from embellished gable boxes. The girls also loved sipping from their KAPOW! straws and polkadot cups. 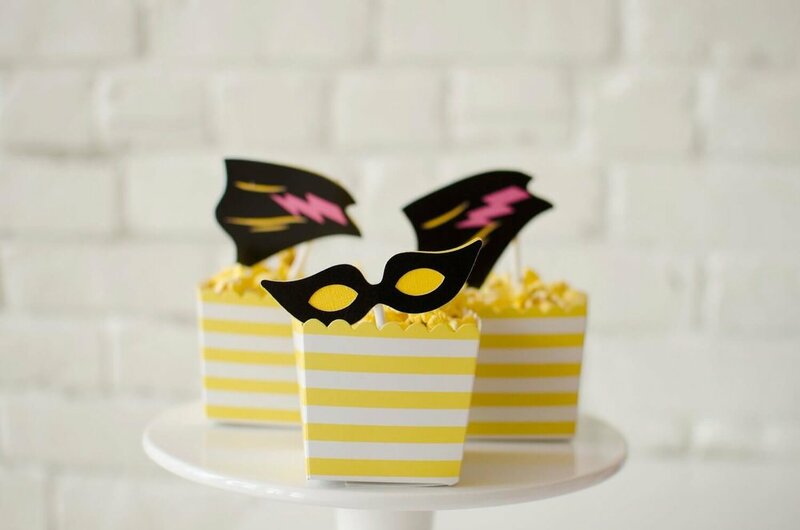 Of course something salty is always a good option for those that are not big fans of sweets, so I added some popcorn to some boxes with a yellow and white stripes and I topped it with some fun cupcake toppers. Each guest received a party favor. An adorable bottle filled with pink gumballs. They were super excited to see the superhero mask on their favors. Hope you all enjoyed looking through all the pictures of this super fun party, and don't forget to sign up for our newsletter to be the first ones to get the latest on party trends. If you would like to order some of the cutouts made exclusively for this party, you can visit Susan's shop here, or you could also purchase them directly.